Arrive in Mandalay where you’ll be greeted by a tour representative for the transfer to the RV Princess Panhwar; which will be your home for the duration of the cruise. The remainder of the day is yours at leisure to make use of the facilities onboard and to relax before a welcome dinner in the evening to get to know your tour director and your fellow travellers. Pay a visit to the impressive Mahamuni Buddha Temple, where you may be able to add your own sheet of gold leaf to a statue of the Mahamuni Buddha. 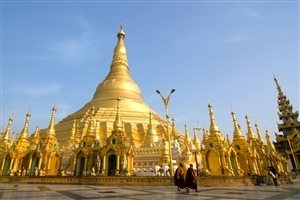 You can then explore a number of local workshops before a tour of the Shwenandaw Monastery and a visit to Kuthodaw Pagoda to see what is said to be the largest book in the world. 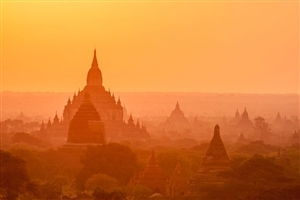 A trip to the top of Mandalay Hill will provide the chance to take in views of the surrounding area, whilst you can also take a walk along the famed U Bein Bridge before a busy day comes to an end. Today you’ll enjoy the chance to visit the Soon U Ponya Shin and Kaunghmudaw pagodas in Sagaing before heading for the workshop of a local silversmith. You’ll then cruise along the river to Inwa for a tour of the ancient imperial capital before a cultural show onboard to end the day. 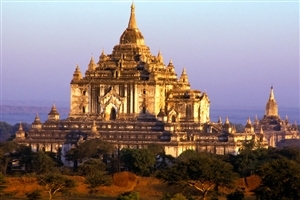 Take in the sights of Myinmu on a walking tour before getting back onboard your boat for the journey towards Bagan. As the city comes into sight, you’ll enjoy an afternoon at leisure. The day starts with a visit to the bustling Nyaung-U market where there is chance to mingle with the locals and browse the various products that are available for sale. You’ll then visit a range of distinctive structures to be found across the city, including the Gubyaukgyi Temple, a 13th-century cave temple with an Indian-style spire. A visit to a local workshop and a trip to a nearby village to see how the local people go about their business will complete the day. The day begins with the opportunity to climb climb Tantkyi Hill to visit Tantkyitaung Pagoda, encircled by 32 elephant statues and believed to house tooth relics of Buddha. After lunch back onboard the boat, you’ll head for the village of Salay to visit the wooden monastery of Sone Kyaung and Shinbin Maha Laba Man Paya - the largest lacquer Buddha image in Burma. Awake to the glorious scenery that can be found along the banks of the Irrawaddy as you continue downstream to the sleepy delta town of Magwe. On arrival, you’ll visit the local market before a trip to the Mya Tha Lun Pagoda in the afternoon. A traditional puppet show provides the entertainment during the evening. Today you’ll stop in the town of Minhla, the site of a significant battle during the Third Anglo-Burmese War, where you’ll switch to a small boat to visit Gwechaung and Minhla forts, built by Italian engineers in 1860 to keep British forces out of Burma. Later, cruise onwards to Thayetmyo, a pleasant port town that once sat on the British colonial border between Upper Burma and Lower Burma. As you continue with your cruise this morning, you’ll be able to take in views of a selection of gilded pagodas alongside the river, including the imposing Shwesandaw Pagoda. Cruising to Sri Ksetra, you can marvel at 1,500 year old brick stupas and temples that are among the earliest Buddhist monuments in the world and take in views of the Akauk Mountains as you continue towards Pyay. Disembark in Myanaung for a walking tour this morning that will take you past various colonial houses and on to the bustling local market. Take in a guided tour of the delta town of Zalon, with its colonial-style wooden buildings and impressive tropical gardens before continuing onwards to Danuphyu - a small town famed for being the location where Maha Bandula led a Burmese defensive against British troops during the First Anglo-Burmese War. Explore the Monastery of Maha Bandula and a home cheroot-making workshop before cruising to Maubin. Arrive in Maubin with its impressive Buddhist pagodas and head out on a walking tour to discover the history of a town that was the birthplace of prominent political activist Ba Maw. You’ll also visit the local market before returning to your ship. 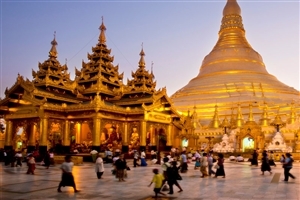 Arrive in the city of Yangon where you will embark on a tour of the major sights - including Sule Pagoda, Kandawgyi Lake and Bogyoke Market. In the afternoon, you can take visit the Reclining Buddha and the Shwedagon Pagoda; the latter featuring a golden spire that dominates the skyline at sunset. A farewell dinner onboard the boat brings the day to a close. After breakfast, transfer to the airport for your onward flight home.